Key tools developed by our project described below. Click on each to learn more!! 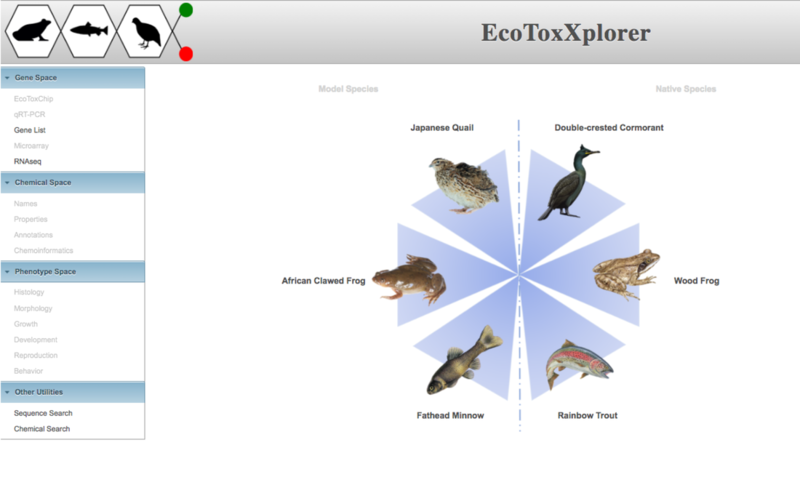 EcoToxXplorer.ca provides intuitive bioinformatics support for users to analyze EcoToxChip results as well as transcriptomics (e.g., RNA-seq) data. It has been modeled on our successful cloud-based tools (metaboanalyst.ca; networkanalyst.ca). Try it out!! Go to the website, click on "RNAseq" (to the left), and then scroll down to "try our test data". for the GE3LS research component. This interactive map lists 90+ entities and projects in the world that are involved in the emergent area of toxicogenomics. They include research projects and consortium, regulatory fora, and various knowledgebases, databases, and tools. The map allows users to have a "bird's eye" view of this knowledge space. They can browse and engage the work of these organizations via their website for more information. A contact form allows users to provide feedback on new organizations.